Gen. Ellen Pawlikowski, commander of Air Force Materiel Command, hands the Air Force Test Center guidon to Maj. Gen. David Harris June 18. 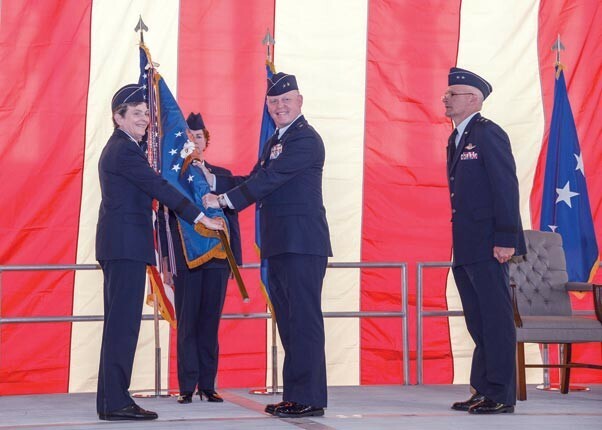 Harris assumed command from Maj. Gen. Arnold W. Bunch Jr. (right) during a change of command ceremony held in Hangar 1600. The Air Force Test Center added a page to its three-year history June 18 when Maj. Gen. David A. Harris stepped into the role of commander. Gen. Ellen M. Pawlikowski, commander of Air Force Materiel Command, presided as the center transitioned to a new leader for the very first time. “The mission of the test center is a sacred trust. If we fail, we must face the widows, widowers and the children left fatherless or motherless because of the system’s fail. We are the safety net; we are the warrior’s best friend,” said Harris. To keep the center guided, the new commander has set three priorities, to be agile, to be ready and to be right. Agility, he said, is being able to respond to a rapidly changing world. To accomplish this, the test center needs to be organized, trained and equipped for maximum efficiency while eliminating wasteful practices. To be ready means staying on the leading edge of technological advances. This happens in the areas of cyber, directed energy and hypersonic flight. Harris’s priorities will build onto a long legacy of test at Edwards AFB. According to Pawlikowski, there has not been a single aircraft in the Air Force inventory since World War II that has not come through the Air Force Test Center before becoming operational. Harris began his career as an electronic warfare officer flying EF-111 combat missions during the first Gulf War. In 1995 he transitioned to the test family as a student at the U.S. Air Force Test Pilot School here at Edwards. After graduation, he was immediately assigned to the 419th Flight Test Squadron as a B-1 experimental flight test navigator and later as the flight commander for the B-1 and unmanned aerial vehicles. During his time at Edwards he also served as project manager for the RS-68 Rocket Engine Test; the last rocket engine to be domestically built in the United States to date. From there he went to Japan where he was part of a major unified command staff and then spent time on Capitol Hill. In 2002 he returned to Edwards as the 419th FLTS commander and Global Power Bomber Combined Test Force director. Now, 10 years later, Harris has returned to Edwards again with his wife Valene from within the AFTC enterprise where he was the 96th Test Wing commander at Eglin Air Force Base, Fla.
As AFTC commander, Harris directs a $31 billion enterprise of more than 18,000 military, civilian and contractor personnel across Edwards, Eglin and Arnold Air Force Base, Tennessee. The AFTC provides developmental test and evaluation of experimental and research manned and unmanned air, space and cyber systems for the military, NASA, international partners and Defense Advanced Research Projects Agency. AFTC also oversees the U.S. Air Force Test Pilot School.